The Hybris distribution needs around 3 Gb on your disk and consists of 30000 folders and around 134000 files. There was a need to have several hybris instances preconfigured for the specific purposes. There is nothing complicated to create a fresh copy to have a completely separate instance. However, this process takes time and the newly created distributive takes more than 3 Gb of my SSD. It could be endured, but it makes me wait each time while 134000 files and 30000 folders are copying from one place to another. Sometimes I need to check some assumptions on the fresh hybris installation. However, once I changed something in the configuration, that instance can’t be longer called “fresh”, because these changes can irreversibly affect the initial state of the system. For example, some changes in the configuration can have the consequence of creating additional files in hybris folders. These files may affect the next run or another configuration. To avoid these problems I create a fresh copy of hybris each time I need to be free from the influence of these files and the database state. The faster I am able to create a fresh copy and test my code on it, the more effective I will be. The approach explained below will allow you to create a fresh copy of hybris on the same HDD in 1 minute. This copy will take ~500 Mb because it shares some of the files with another instance. 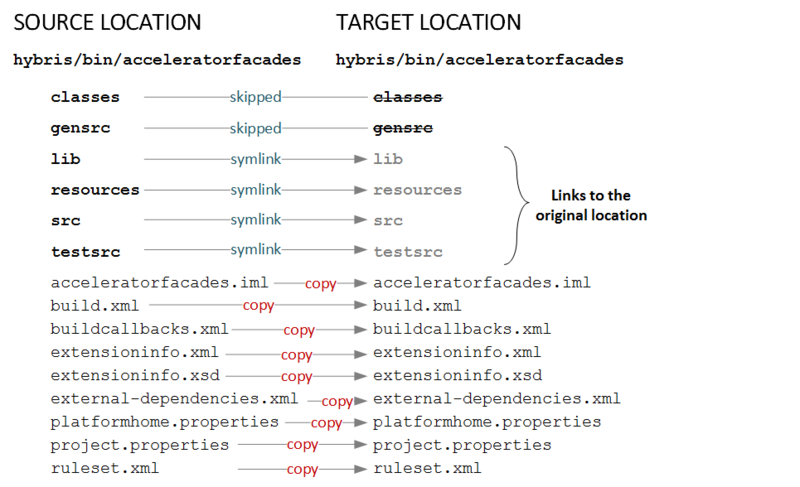 For example, for the acceleratorfacades module two folders are skipped, all root files are copied, the remaining folders are symlinked to the original location. As a result, the cloned copy of the extension is much smaller than if you copy all folders. Creating a new clone takes about a minute + initialization (8min). Download the Bash version here. It is similar to the Windows version. Download the Windows version here. You can find some excerpts to domonstrate the concept. Change first two lines in the script below. SOURCE is a folder where hybris 6.1 is installed. TARGET is a folder to create. This script creates a base folder structure. Some folders are symlinks to the source hybris folders. Don’t copy the script below. Use this link instead.